"On the morning of Good Friday I received Communion, and during the day I wanted to attend the Three Hours of Agony (popular Catholic Church celebration held between 12:00 and 3pm on Good Friday's in honor of Jesus crucified--Editor) but my family would not let me, even though I cried, and only with great effort did I make this first sacrifice for Jesus. Jesus, always so generous, even though I had sacrificed only reluctantly, wanted to reward me; so, I shut myself in my room to pray the three hours privately, but not alone; my guardian angel came and we prayed together: we assisted Jesus in all His sufferings and comforted our Mother (the Blessed Virgin Mary- editor) in Her sorrows. Nevertheless, my angel did give me a gentle reproach, saying that I should not cry when I had to make some sacrifice for Jesus, but instead I should thank those who had given me the opportunity to do so. This was the first time and also the first Friday that Jesus made Himself felt so strongly in my soul; even though I did not receive the True Jesus from the hands of the priest, (the Holy Eucharist--editor) because it was impossible, still Jesus came on His own and gave me Communion. But this union of ours was so strong that I remained dumbfounded. "Oh Jesus, how can this be? You the most perfect- the most Holy- How can you love someone who shows nothing but coldness and imperfection towards You?" He replied "I am burning with a desire to unite with you." Jesus then repeated "run to me every morning (in receiving Holy Communion--editor) "however" He said, I am a jealous Father and Bridegroom; will you be my faithful daughter and bride?" I made a thousand promises to Jesus that morning, but oh my God, how quickly I forgot them! Oh! 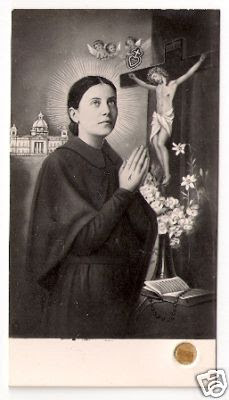 Thank you so much, my Lord, for the grace to discover this holy soul, St Gemma. So long i had the book The Gem of Christ on my library shelf but, never opened it. I want to read all i can about this saint. St Gemma keep you in her prayers always for having this computer web site so all the people can read and learn more. The book "The Gem of Christ -The story of St Gemma of Lucca" is somewhat of a rare book and a little hard to find. You are fortunate to have a copy. I am certain you will enjoy it and find it very inspirational. Thank you for your kind comment. Great quotes from great st. I really impressed. I am not able to find right words. I am speechless. I am glad to hear that you enjoyed this article. Thanks for your comments. To many people, St Gemma's autobiography has an extraordinary impact on their spiritual lives. It was the autobiography in fact that led me to my devotion and admiration of Gemma...it was the first thing that I read of her. My copy is well worn and full of highlighting, as I read it seeral times over, since I was so edified and inspired by it. It was only some times afterwards that I read Venerable Father Germanus' "Life of St Gemma". Only God can make saints. St. Gemma, loved despite all of her faults, trusted in Jesus and now...I am in awe of how God works in our souls to draw us closer to Himself in Love and Mercy.